In just six weeks the Elite League will crown its champion, with every game vital to a team's chances of success, but perhaps none more so than this weekend. The Elite League's heavyweights, Belfast Giants and Cardiff Devils, go head to head twice in two days at the SSE Arena as they battle for top spot. The Welsh side will take a three-point lead into the weekend but all that could change before the sun rises over the Irish sea early on Sunday morning. It is difficult to understate how crucial Friday and Saturday's matches on each's chance of being crowned champion at the end of March. If its importance needed evidencing, more than 600 Devils fans are making the trip for the double-header, the biggest number the club has ever taken to Belfast. For the Devils, two regulation-time wins would leave them seven points clear of the Giants, with just 11 games left for the Northern Irish team. Andrew Lord's Devils will know that is within their ability, having completed a four-point weekend against the same opponents just last month, albeit in Cardiff. The Giants will not fear the Devils though. 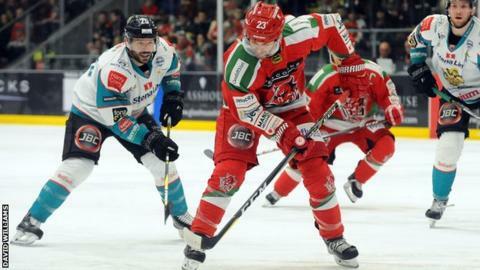 Adam Keefe's side inflicted the heaviest defeat on the Devils in two years back in November when they went into Cardiff and dismantled their opponents on the way to a 8-1 victory. In fact, the notion of home advantage regularly goes out the window when these sides meet. The Devils sealed the Elite League title at the SSE Arena last March, just two weeks after the Giants won the Challenge Cup against the Welsh side in Cardiff. And while Devils coach Lord will be hoping to repeat the scenes of jubilation which filled the Belfast arena last year, Keefe will be hoping for anything but. Ontario-born Keefe has both played and coached numerous Giants and Devils match-ups since he moved to Northern Ireland in 2011. The 34-year-old, now in his second year of coaching, is hoping his side hit their stride straight away on Friday night against the league leaders. "We need to get off to a good start, especially being on home ice we want to give our fans something to cheer about," said Keefe. "Every game against Cardiff is a four-point game, it's a good challenge for us, they are a real quality side that have won back-to-back championships for a reason." Younger brother to American Hockey League's Toronto Marlies head coach Sheldon Keefe, the former Giants captain says he is relishing the opportunity to play the best the Elite League has to offer. "They [Cardiff Devils] know how to win and its a great test for our guys and our club to go up against that," added Keefe. "I'm sure that in the circumstances our guys will rise to the occasion." If the Giants get the two wins they are looking for they will end the weekend top of the pile, and momentum will well and truly have shifted in favour of the Northern Irish side. Vancouver native Lord, like his opposite number this weekend, knows all about these sort of encounters in the Elite League. Like Keefe, Lord joined the Elite League as a player and has moved up the ranks from player to coach in the few years since he left the American Hockey League. Lord, who will be hoping to celebrate his 34th birthday on Friday with victory, says he is expecting his opponents to be at their very best, despite losing their last match 5-0 against Glasgow Clan. "Belfast are a very similar team to us so I expect nothing but their best," said Lord. "It's the big one, definitely right up there, the fact it is against the team also going for the title makes it that much bigger. "It's our fifth year in a row going down to the wire, we are used to this and we are excited about the big weekend, big games and the pressure, it is something we thrive on and we are looking forward to it." The Devils coach says he is also looking forward to the tactical battle with Keefe, one he compared to a "chess match". "It's my favourite part of being a coach, it is a real challenge," added Lord. "A lot of time is put into it, a lot of preparation, sometimes it doesn't pan out and others it does but when you see things you have implemented work it is a big high as a coach. "I don't see it as work, it is my passion."